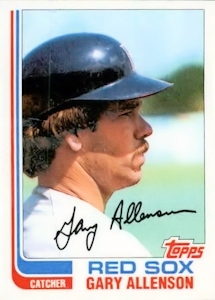 ON THIS DATE (August 28, 1982) ... Gary Allenson won a ballgame by beating out a bunt. That's what Allenson did in the 10th inning, as the Red Sox pulled out a 7-6 victory over the California Angels in about as exciting a finish as you'll see. Gary Allenson, who often has been described as a walking fireplug because of his 5-foot-11, 185-pound frame, had a stride that was fleet in the 10th. He dropped a perfect bunt with the bases loaded, shocking the Angels, Sox manager Ralph Houk and a crowd of 34,722 at Fenway Park. It stunned losing pitcher Bruce Kison, who was too far away to field it. It embarrassed third baseman Doug DeCinces, who was back guarding against everything but what happened. All he could do while Carney Lansford scored from third base was barehand the ball and try to get off a throw to first. He did, but it was too feeble and much too late. The bunt single gave the Red Sox a much-needed victory. And it capped a remarkable comeback. They had overcome a 5-0 deficit with five runs in the seventh inning. Then squandered a 6-5 lead in the ninth before Allenson saved them. Lansford helped make sure that the Sox wouldn't be demoralized. He doubled during the five-run, six-hit, seventh-inning surge that chased California starter Mike Witt and put the game in the hands of the Angels bullpen. With one out in the 10th, he singled past short for the first hit off Kison. Next he stole second, and then he took third as part of a double steal. Catcher Bob Boone had been replaced by Joe Ferguson, and the Sox showed absolutely no respect for him. Lansford kept the Red Sox going after they'd fallen into a deep hole. Starter John Tudor pitched decently before he was battered for five runs in the sixth, with two of them on a windblown homer by Rod Carew. But after erasing that deficit and taking the lead, the Sox almost gave the game right back to California. With two men on and one out in the ninth, Tom Burgmeier gave way to Mark Clear. Clear promptly walked Reggie Jackson and Brian Downing, forcing in the tying run. But an inning later, Allenson took him off the hook. Jim Rice, returning to the lineup after missing eight games with back troubles, opened the seventh with a single. With one out, Lansford doubled, Wade Boggs and Reid Nichols both got clutch hits, and Dave Stapleton came through with a three-run homer that tied it, 5-5. All of it happened because the Red Sox once again played as they had earlier in the season, when no deficit seemed too great.